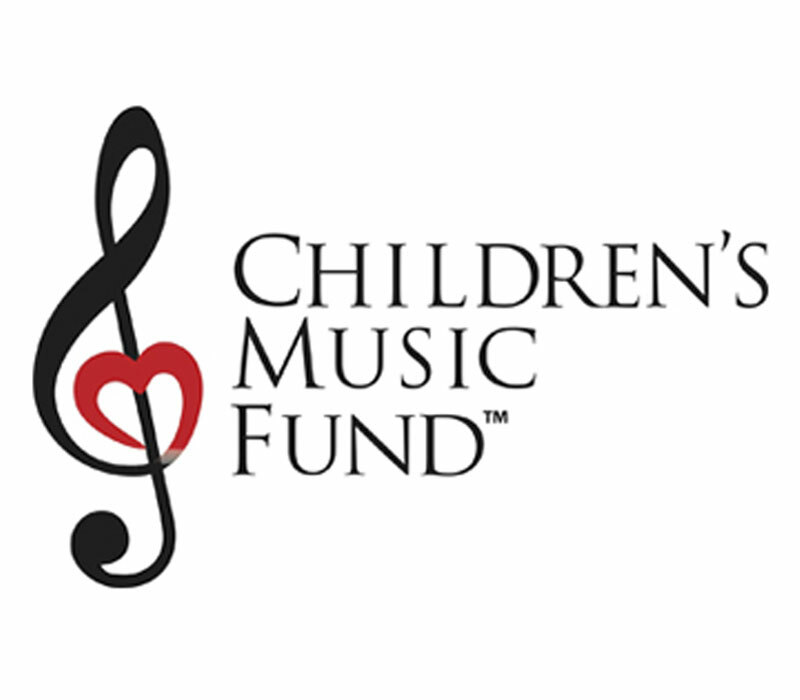 All Proceeds from ticket sales for the Pop-Up Synth Museum will benefit the Children's Music Fund. At Synthplex™ we believe it is critical that we all work hard to continue the further education of our younger generations when it comes to music and especially electronic/ synth music. For that reason we have pledged to start an annual fund-raising event called the Synthplex™ Pop-Up Synth Museum, and through this museum we will donate the profits to various music schools and music programs that are dedicated to electronic and synthesizer music in particular. Each year we are committed to supporting music education, and this year we are supporting the Children's Music Fund with the profits from our Pop-up Synth Museum, where we will have some incredible instruments where visitors can get hands on with these rare instruments. The Optigan was released in 1971 by Optigan Corporation, which was a subsidiary of Mattel, Inc. of El Segundo, CA with the manufacturing plant located nearby in Compton, California. The Optigan was promoted in the Sears-Roebuck catalog and the marketing plan was to make this a household instrument for all to enjoy, musicians and non-musicians alike. The Optigan's playback system functioned much like the storage and reading of an optical soundtrack as was used in motion pictures. The Optigan utilizes a light bulb to energize a row of photodiodes on the opposite side of the spinning 12" clear film disc (officially referred to as "Program Discs") which are encoded with fifty-seven concentric optical tracks. The system then translated the analog waveforms on the disc to an audio signal. A flip-down door beneath the keyboard allowed access to the disc's loading area to the left of the unit and a disc storage area to the right. Thirty-seven tracks were sustained or repeatedly percussive notes in the timbre of a particular instrument and were played through a standard three-octave piano-style keyboard with the right hand; twenty-one were of a live band or soloist playing chords in different keys arranged per the circle of fifths, specifically B-flat, F, C, G, D, A and E major, minor, and diminished and were played with the left hand in much the style of a chord organ or accordion. The remaining five were assigned to rocker switches above the chord buttons and featured (depending on the disc in question) percussion, sound effects, introductions, vamps, and endings synchronized with the chord buttons. Pushing upward on the rocker switches locked them in place for use with percussion; pushing downward allowed momentary use for vamps, introductions and endings. 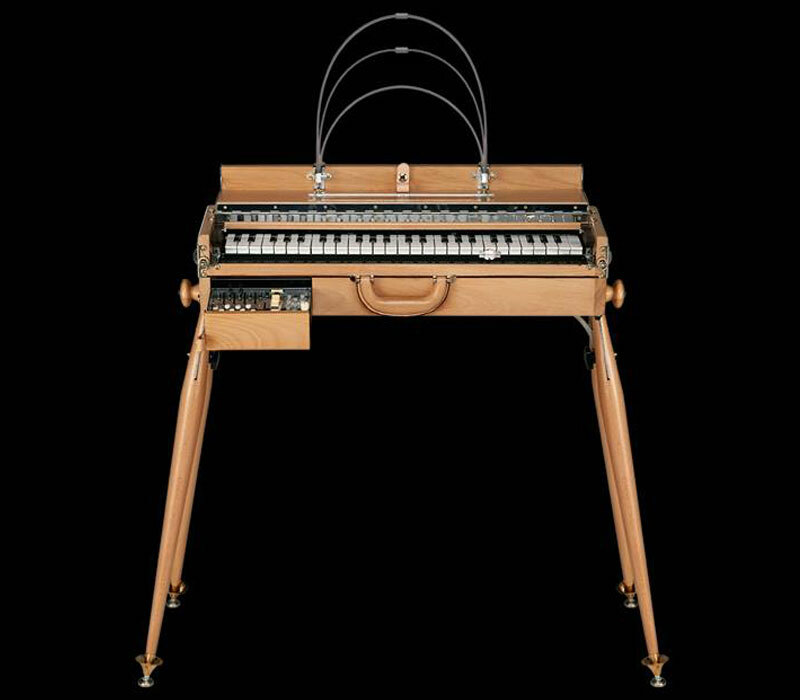 Despite its use of recordings of actual musical instruments in lieu of internally generated sounds, the Optigan suffered from poor tonal quality due not only to the bandwidth limitations of its optical system but its mechanical system as well. The Optigan concept was similar to that of the Mellotron (early sampling technology) but while the Mellotron used magnetic tape, the Optigan borrowed its technology from motion picture optical soundtrack technology and its amplitude modulated format. 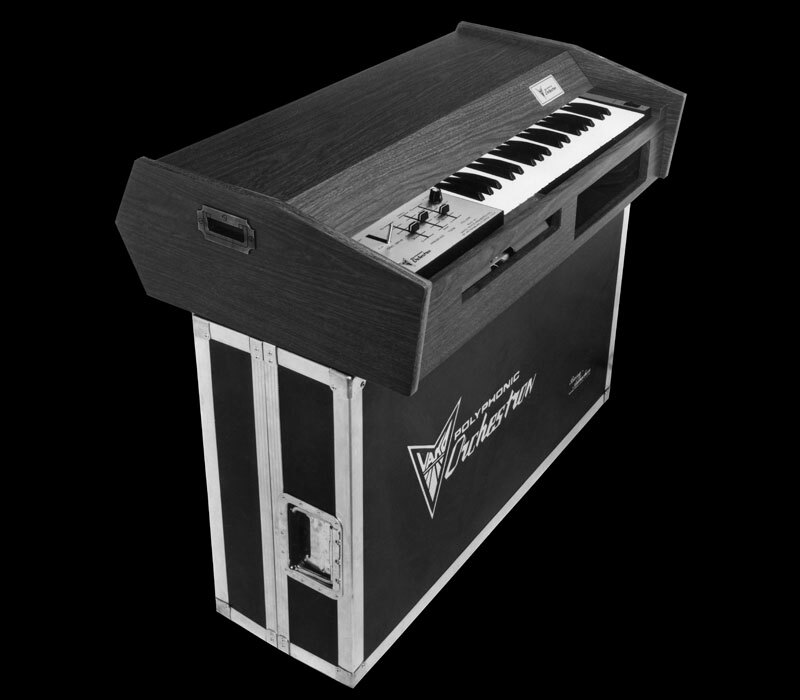 The Orchestron was initially developed by Vako Synthesizers Incorporated and Vako was founded by ex-Moog technician and salesman David Van Koevering. David launched the Orchestron in the mid 1970's as an alternative to the Mellotron and some of the major advantages over the Mellotron, was increased portability, and the lack of the 8 second note limitation, due to the continual waveforms looping on the optical discs vs. strips of tape as found on a Mellotron. In theory this was a great concept because Mellotrons were indeed cumbersome and musicians had to create unique and specialized playing techniques in an attempt to disguise the 8 second limitation on the Mellotron. Both the Optigan and Orchestron have their own unique character traits and that is sometimes described as “grainy” or “lo-fi awesomeness”. The Orchestron did away with the Optigan's cheesy backing tracks opting instead to provide a selection of discs containing sounds such as Choir, Violins, Cello, Organs (Hammond and Pipe Organ) French Horn and Saxophone. The Orchestron is loved for many reasons, including; 1) it's a “madcap instrument” which embodies the pioneering spirit so evident in the keyboard/ synthesizer industry during the 1970s, 2) The On/Off switch is named 'Juice'. Furthermore, any Kraftwerk fan playing the Choir disc will immediately recognize that sound from several of their tracks including Europe Endless. Kraftwerk also used the Orchestron on; Radio-Activity (1975), Trans Europe Express (1977) and The Man-Machine (1978). Notably, the Orchestron was also used on The Yes album Relayer. Pea Hicks has made it his mission to keep the spirit of the Optigan & Orchestron alive and he has a ton of information on his optigan.com website and Pea occasionally releases new discs for these optical disc instruments. Pea has also been involved with working with Costa Mesa based Quilter Laboratories, LLC who have now developed a brand-new version of the Optigan called the Panoptigon. Quilter will be showing the Panoptigon at Synthplex this year. 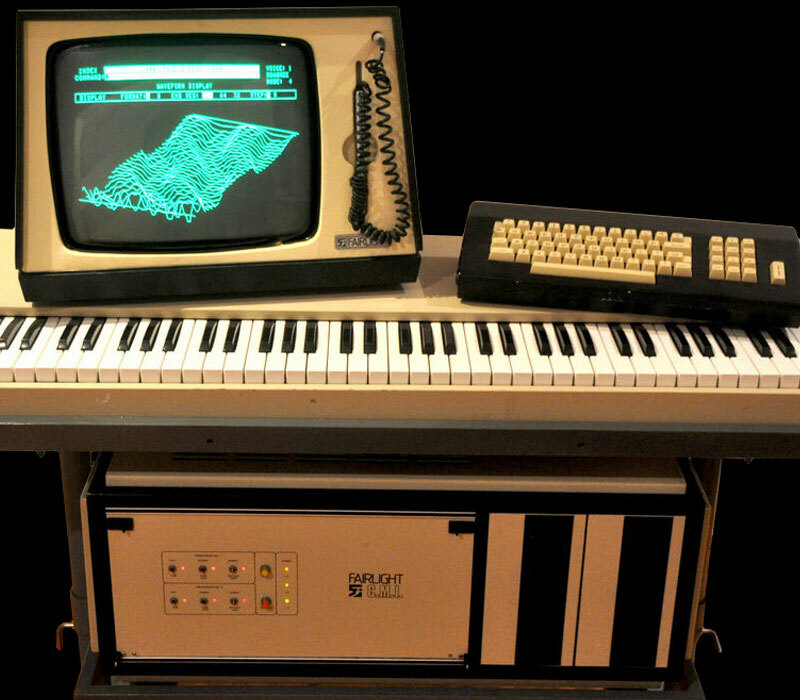 The Australian Fairlight Computer Music Instrument (CMI) is a vintage but state-of-the-art Synthesizer/Sampler workstation. At the time, this was considered the holy grail of samplers, with a whopping 14 megabytes of RAM, which equates to about a three-minute long stereo sample, the Series III was the first sampler capable of creating sounds with 16-bit, 44.1 kilohertz sample files, as well as 16-voice polyphonic patches. Its design, graphics, and editing tools were also improved, such as the addition of a tablet next to the QWERTY keys for the lightpen to point on instead of on the screen; this change was done due to arguments from users regarding arm aches from having to hold the pen on the screen. You could also order it with either 1 or 2 two full 73 note velocity sensitive keyboards and it offered complete sample synthesis and full editing of the digitally sampled sounds. It also had three separate on-board SMPTE Sequencers all with storage to various disk mediums. 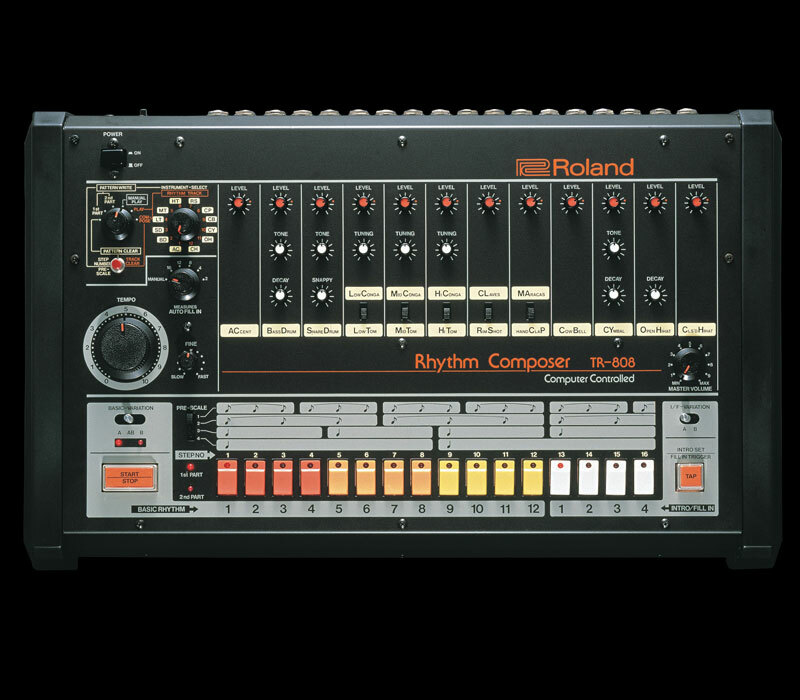 The processor itself was housed in a 24" module and it was the first digital sampler to hit the market back in 1979. From 1979 to 1985 several versions of the Fairlight were produced, with the Series III being the last of them. Each new series added updates to the Fairlight as technology developed through the early eighties. The Series III added aftertouch capability to the keyboard and all the previous versions also had; pitch/mod wheels, an 82-key alphanumeric keyboard, 15 function keys, a Graphics Tablet for drawing sounds and a Video Monitor for seeing what you were editing. The Fairlight was an extremely expensive Music Production Center and as such it was used by all the pros in the music, sound designing & film composing business including; ABC, Heaven 17, Depeche Mode, Hall & Oates, Jean-Michel Jarre, Thomas Dolby, Michael Jackson, Yes, Trevor Horn (Art of Noise), Geoff Downes, Stevie Wonder, Vince Clarke (Yazoo), Peter Gabriel, Paul McCartney, Devo, Julian Lennon, The Cars, Yellow, Herbie Hancock, David Gilmour, Scritti Politti, Eurythmics, Prince, OMD, Duran Duran, Kate Bush, Keith Emerson, Alan Parsons, B-52's, Pet Shop Boys, Stewart Copeland and many more. Michael Boddicker remembers using this Series III sampler on many sessions, but perhaps most memorable was on the Michael Jackson video for Black or White and there is a scene (cue up around the 6:40 mark) where a black panther transforms into Michael Jackson. Although current samplers, sequencers and synths can blow away the Fairlight at a fraction of the cost - the Fairlight has a special historical place as the sounds that shaped the music industry during the 80’s were most often created using the Fairlight. 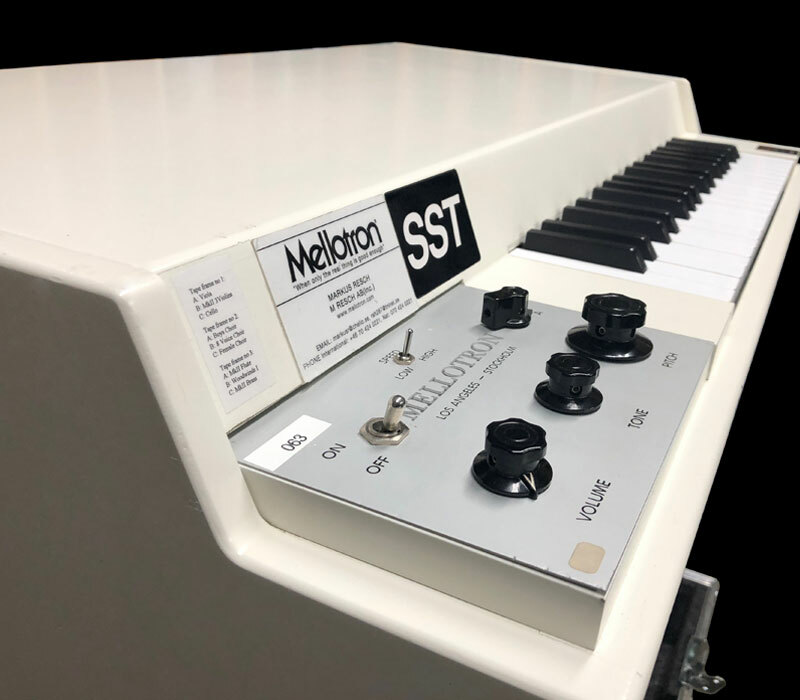 The Mellotron is an absolute classic electro-mechanical sampler that was originally developed and built in Birmingham, England, in 1963 by the Bradmatic/ Mellotronics company. 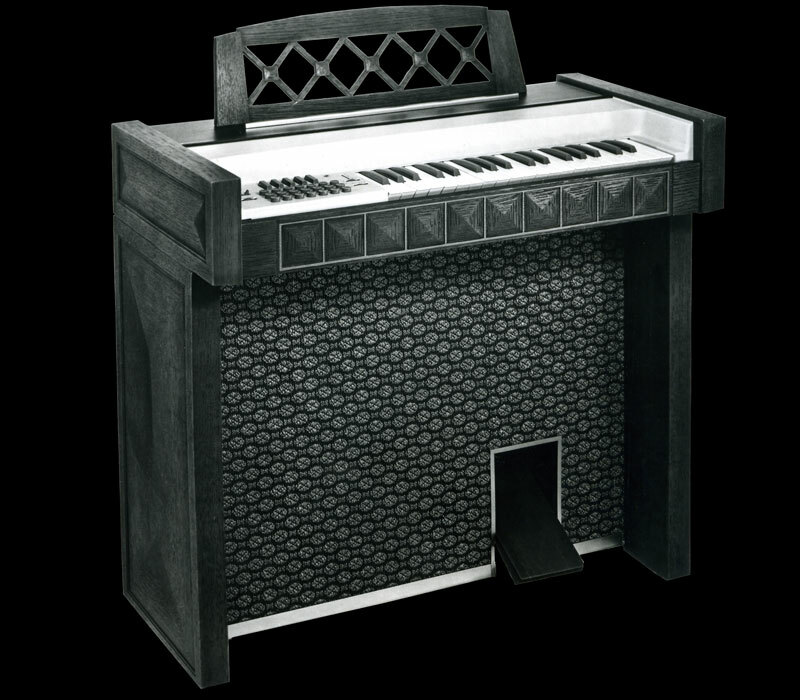 It evolved from a very similar instrument called the Chamberlin, but the Mellotron could be mass-produced more cost effectively. The instrument is played by pressing its keys, each of which presses a length of magnetic tape against a capstan, drawing it across a playback head. Then as the key is released, the tape is retracted by a spring to its home position and different portions of the tape can be played to access different sounds. The first models were designed to be used in the home, and contained a variety of sounds, including automatic accompaniments. Bandleader Eric Robinson (conductor) and television personality and David Nixon (magician) were both heavily involved in initial promotion of the Mellotron. The Mellotron became popular after The Beatles used it on several of their tracks. After that, it was subsequently used by major artists such as; The Moody Blues, King Crimson and Genesis, and it became a common instrument in Progressive rock. Later models such as the M400, the best-selling model, dispensed with the accompaniments and some sound selection controls in order to be used by touring musicians. The Mellotron was not widely used in the 1980s but a few artists like OMD and XTC did use it extensively and in recent years it has staged yet another come back with several high-profile users embracing it such as; Oasis and Radiohead. This Mark VI was released circa 1999 when the company reestablished itself again and it was the first new Mellotron to be produced since Streetly Electronics went out of business in 1986. 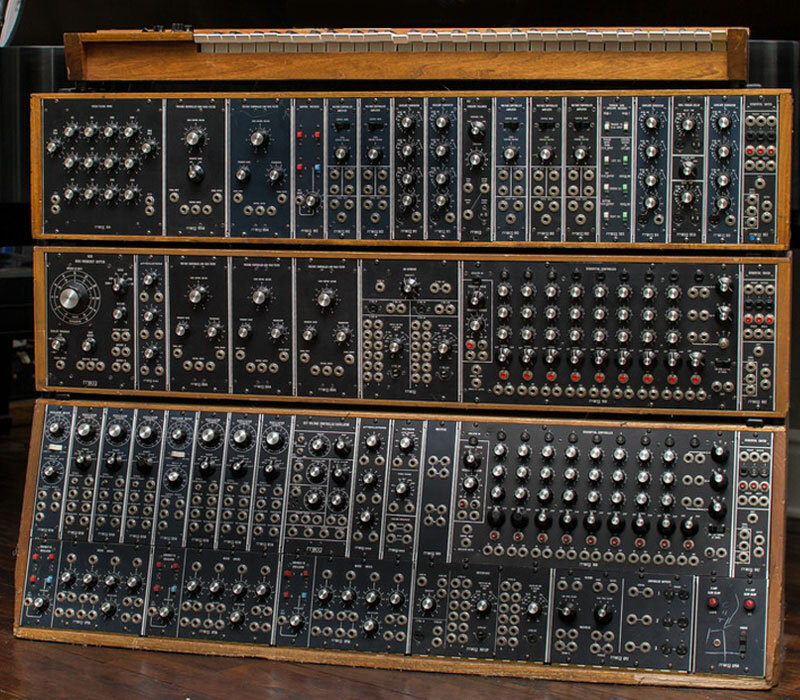 This Moog Modular was hand delivered to Los Angeles by Bob Moog himself sometime in 1974. Bob personally drove this synthesizer across country from New York, so he could personally make sure everything was right upon delivery. Michael used this massive synth on countless studio sessions including all of his sessions with Michael Jackson. His Modular 55 was patched & programmed by Michael Boddicker for the synth parts on Billie Jean and Thriller. It was also used for Donna Summers tracks, Finger on the Trigger and State of Independence. It was also used in recording sessions on several Laura Branigan albums, including her featured track, Imagination, which was in the 1983 smash hit movie Flashdance. This Boddicker owned Model 55 was designed and largely built by Bob Moog himself and it is a beautiful instrument to behold. Operation of the Modular 55 is quite musician-friendly as it features very straight forward input and output jacks and all the knobs are clearly labeled. Thee voltage-controlled oscillator modules produce stunning tones and this unit has rather stable tuning once it is up to temperature. The real legendary Moog sound comes from the 24 dB/oct lowpass filter (the 904A). To this day, no one has come close to improving upon the original Moog filter and its patented ladder design. Additional modules include VCAs, envelope generators, highpass filters, equalizers, noise generators, a sequencer, and utilitarian modules such as audio mixers, control voltage processors and power supplies. There is no dedicated LFO module, however. Instead, one of the VCO modules has a rate slow enough (0.1 Hz) that it can be used as an LFO instead of a sound source. 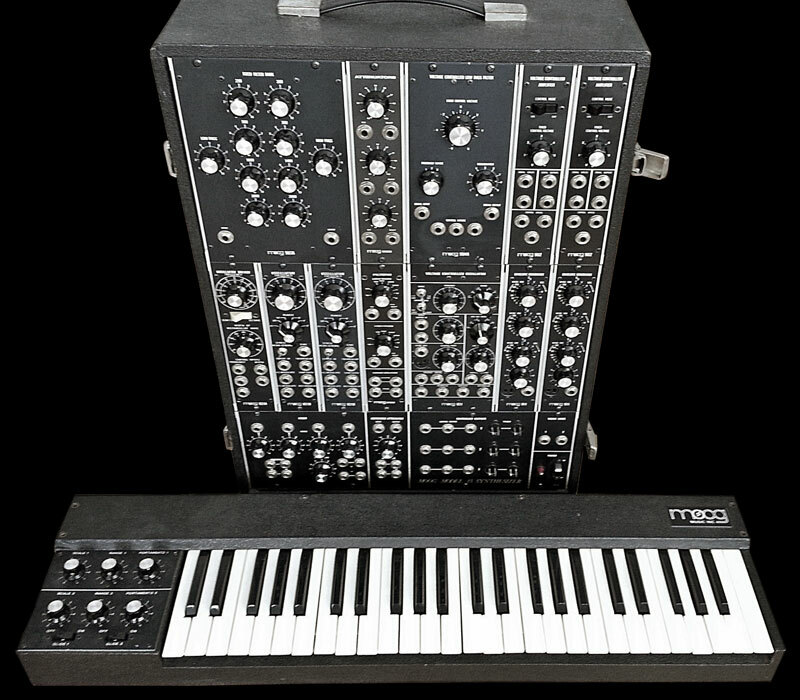 The Moog Modular 15 was built from 1973 to 1981 and it was a complete studio synthesizer in a portable package and this smaller size allowed Michael Boddicker to have this unit delivered easily to various studio sessions while his larger Modular 55 was being packed up at another session across town. The model Modular 15 was also the introduction of the new 921 series oscillators. These revised VCO 921 modules provided more stability with the tuning. The legendary Moog sound truly comes from its 24 dB/oct lowpass filter, which is the 904A module. To this day, no others have come close to improving upon the original Moog filter and its patented ladder design. Give this Model 15 a test drive and see for yourself why this is such a beast in a small package. Michael used this Modular 15 on Lionel Ritchie’s session for You Are. It was also used heavily on the Cheap Trick albums including, On Top Of The World and Surrender. 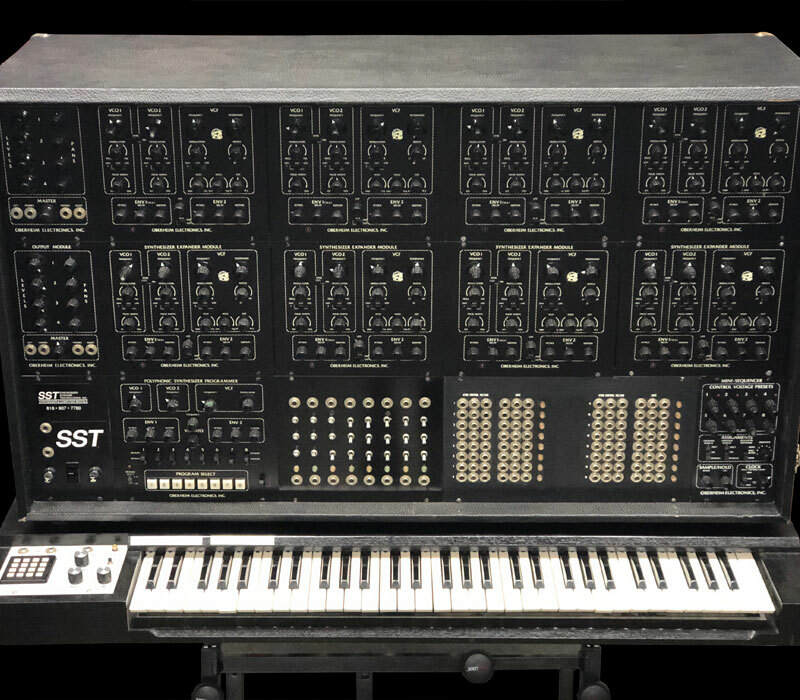 The Electrocomp model 101 was the successor to the, even more rare, model 100 from Electronic Music Laboratories, who were based out of Vernon, CT (1968-1984). Like the ARP 2600, the model 101 is a ¼” patchable semi-modular synthesizer with a hard-wired voice path that could be rerouted via patch cables. But unlike the ARP, the EML Electrocomp 101 had as many as four oscillators (two of which could go sub-sonic, for use as LFOs) with multiple waveforms that you could sweep between using the rotary knobs. The 101 was also Duophonic so you could play up to two notes at a time. Another major distinction from the Moog and ARP synthesizers that utilized transistors, that would tend to drift out of tune under various operating temperatures, EML used Op Amps which proved to be far more stable and reliable. Other onboard features include; a voltage controlled 12 dB/oct multi-mode filter with resonance, two envelope generators, ring/amplitude modulator, noise, and sample-and-hold (labeled "Sampler"). Furthermore, the EML model 101 makes no distinction between control voltage and audio paths allowing just about any source to be patched to any control or audio input in any order. 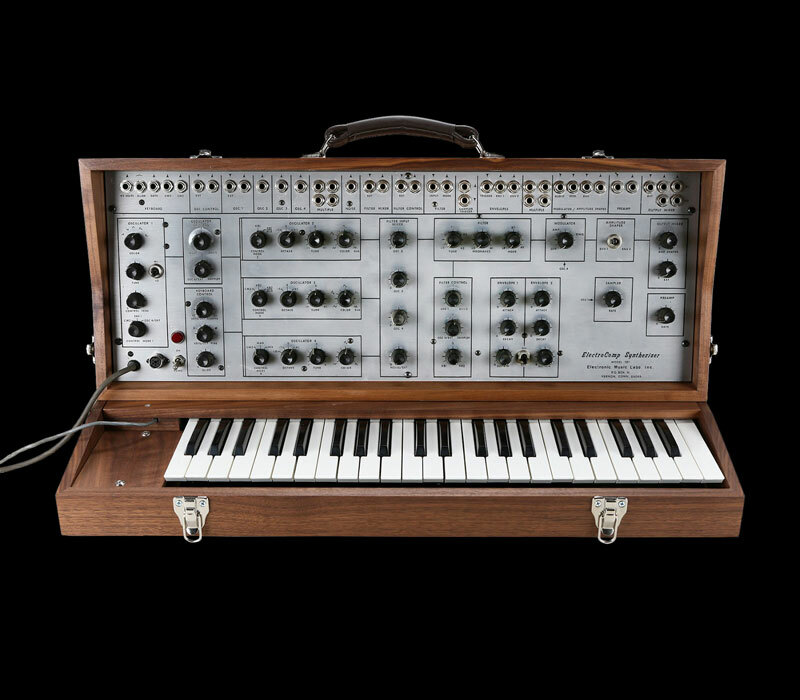 The EML 101 was also very portable and it could be closed & latched, and it was in a beautiful wooden case. In its heyday, the EML 101 were mostly sold to universities and other educational markets. But with the 4-oscillator architecture, multi-mode filter, and elaborate patch control, the EML-101 was undoubtedly one of the most flexible of all of the portable & patchable synthesizers on the market. Thus the EML 101 found its way into mainstream music and it has been used by; Skinny Puppy, Tommy Mars, Download, Weezer, Foreigner, and Ohm. This is one of Michael Boddicker’s favorite synthesizers that he owns, and this Oberheim Eight Voice is “super fat” and has eight separately controllable voices and it is a true vintage classic synth designed by the legend himself Tom Oberheim. Originally this unit was owned by Yes and Moody Blues keyboardist Patrick Moraz. The Eight Voice is essentially eight (8) SEM modules stacked together alongside the Polyphonic Synthesizer Programmer for patch memory. It also featured a simple analog mixer, and a 49-note keyboard. The Oberheim Eight Voice gives you an eight-voice polyphonic/ polytonal synthesizer with 16 VCO's, 8 VCFs, 16 ADR envelope generators and more. Because the Eight Voice derives its polyphony from having eight mono-synth modules hard-wired together, this delivers some pros and cons. What is incredible about this design, is that all of the 8 voices could be played simultaneously and when this sound was introduced, there was no mistaking it for anything other than an Eight Voice Oberheim. You also had the ability to design a different sound on each of the eight-voices and that led to some incredibly unique and complex sounds being generated. The downside was that it also meant you had to program each of those voices independently and this could be time consuming work. Fortunately, the on-board Polyphonic Synthesizer Programmer could store up to 16 patches per voice so that you could save your programs without losing them, which made this a valuable tool that Michael Boddicker used in his large stable of synths for studio sessions. The Oberheim model OB-1 is a simple and fantastic monophonic synth from Oberheim that was not widely popular, making it a rare synthesizer today. 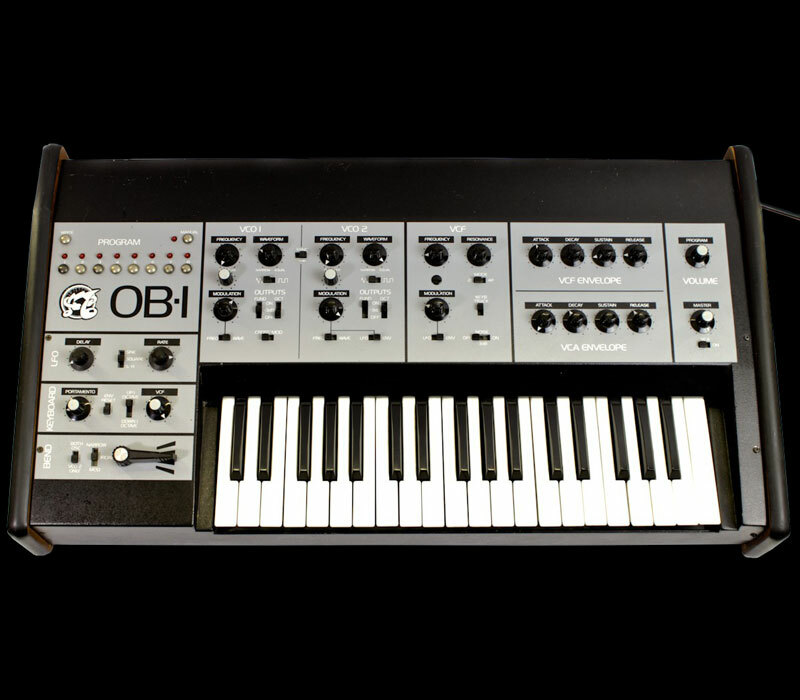 The OB-1 was based on the same synth architecture as the Oberheim SEM model. The OB-1 was first introduced in 1978 at the NAMM show and it was the first truly programmable analog synth of its time with room to store 8 programs in the memory bank. The OB-1 delivers classic and fat sounding Oberheim bass & lead synth sounds and some claim it sounds similar to the Roland SH-101 or the MicroMoog. The OB-1 has two analog oscillators and it has a very capable 2 or 4 pole switchable VCF that sounds just amazing, and it has a quality LFO that can control either the VCA or VCF. The Oberheim OB-1 was a versatile mono-synth for its time and it made for an interesting alternative sound vs. some of the other more common bass-synths of this era like the Minimoog Model D. The Oberheim OB-1 has been used by Tangerine Dream, Rush, Vince Clarke and The Grid. Michael Boddicker fondly remembers using this particular synth during the recording session for The Brothers Johnson, and their hit single titled Stomp, that was produced by Quincy Jones. You can really hear that special Oberheim sound cutting through on the lead synth riff. The Roland Jupiter 8 was an amazing analog synthesizer from Roland and its rich and unique sound still holds up today with what can be described as a very classic Roland Jupiter vibe. The Roland Jupiter 8 is an 8-voice polyphonic synthesizer that featured a total of 16 analog oscillators (2 per voice) and with these eight voices you could get some very chunky analog sounds from it. The Roland Jupiter 8 was also very easy to program with a front panel that was well laid out and featured sliders, knobs and buttons for each of the functions for no “menu-diving”. The long-standing legacy and continued popularity of the Jupiter 8 and all the other Jupiter’s is largely due to their unique voice architecture and intuitive design. 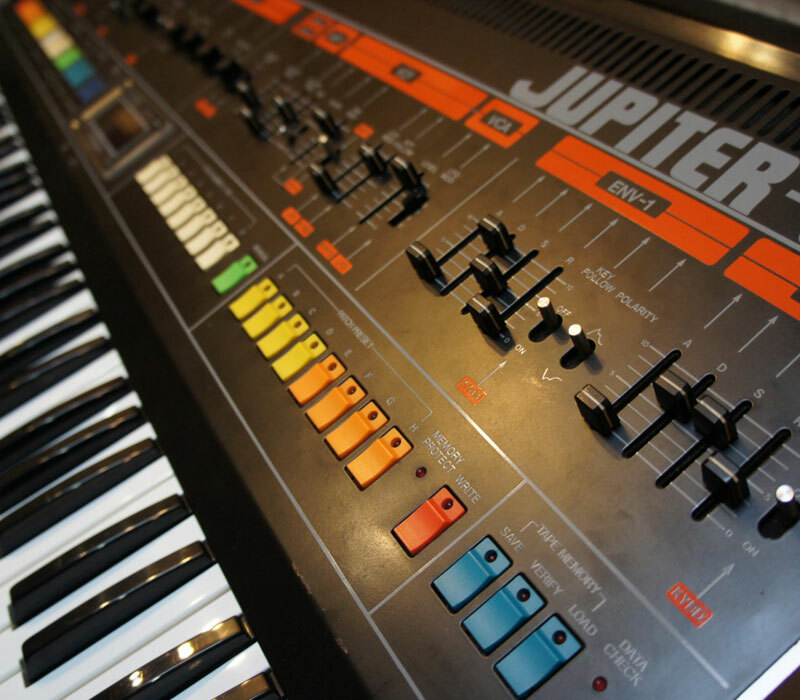 The Jupiter 8 made creating new sounds rather easy and those in the know, knew the Jupiter sound when they heard it. The Jupiter 8 was among the first synths to allow its keyboard to be split and layered. It also features; Cross-modulation, Oscillator sync, a fantastic LFO, Arpeggiator, Analog low pass filter, where you can select 2-pole (12 dB/oct) or 4-pole (24 dB/oct) modes, and it also has a separate high-pass filter. The Jupiter 8 was also released pre-MIDI but this Jupiter 8 has a MIDI retro-kit installed. Patch presets can be stored and so can your; keyboard splits, arpeggiator settings, voice assign mode, hold, portamento and modulation settings. The Jupiter-8 was and still is widely used by all the pros including; Tangerine Dream, Orbital, Heaven 17, Moby, Duran Duran, Vince Clarke, Jean Michel Jarre, Roxy Music, OMD, A Flock Of Seagulls, Depeche Mode, Thomas Dolby, Howard Jones, The Cars, Prince, Jan Hammer, BT, Tears for Fears, Moog Cookbook, Toto, Yes, Devo, George Duke, Greg Phillanganes, Jonathan Cain of Journey, Greg Johnson & Kevin Kendrick of Cameo, Stevie Wonder and Simple Minds. Michael Boddicker used this Jupiter 8 on Michael Jackson’s track The Way You Make Me Feel and also on Jackson’s Thriller album. He also used this Jupiter 8 in sessions for two of Lionel Ritchie’s smash hits; All Night and Running with the Night. This is not the rarest analog synth around here, but it is a legendary synth that not everyone has had the opportunity to play with it… so here is your chance. This new Japanese instrument is a true piece of craftsmanship and these Asaden Omdomo’s have a beautiful sounding speaker and quality tone control. The tiroir (control box) lets the user mix between speaker outputs and waveform selection. Ondomo has also made this new instrument far more compact and portable over the old original Ondes Martenot instruments. The CS-80 also has two analog oscillators per voice that produce incredibly thick sounds, plus a great sounding VCF with independent high-pass and low-pass resonant filters, a great ring modulator and tons of modulation controls that further enhance the CS-80's incredible sound. This was the early days of on-board patch memory and there were 22 preset sounds, with 6 of those being editable. The keyboard is weighted and has a full 61 keys with performance controllers for vibrato, pitch, brightness and volume. A unique feature is the long ribbon controller used for long sweeping pitch-bends and that is located front and center just above the keyboard. There was no MIDI or cv/gate control and that time but many have now been retrofitted with MIDI controls. 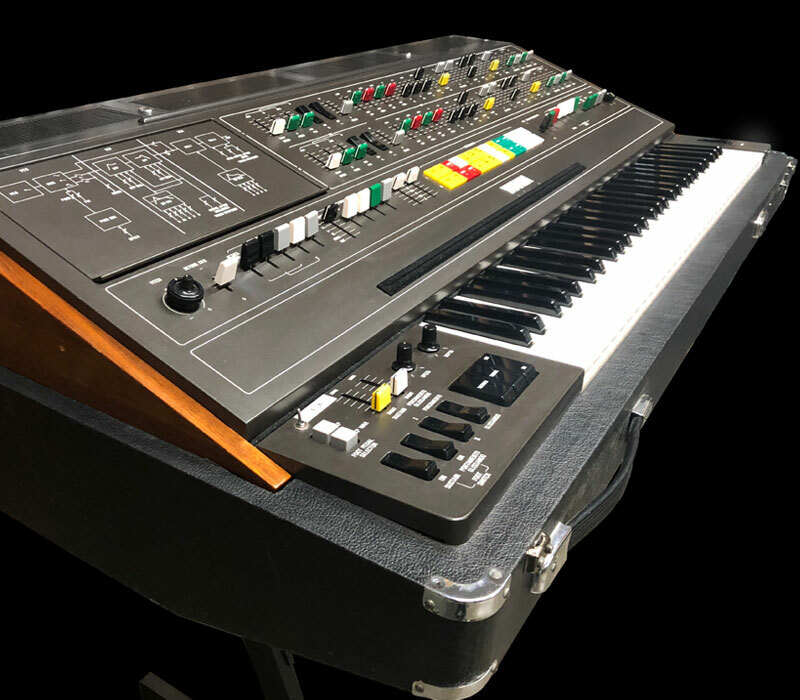 Michael Boddicker used this beast on Michael Jackson’s Billy Jean and also on Barbra Streisand’s smash hit Somewhere, where you can hear that legendary CS-80 sound making that track sound so dreamy and beautiful. During the 70’s and 80’s, the Synare was a very popular electronic drum “kit” or pads made by Star Instruments, out of Stafford Springs, CT. 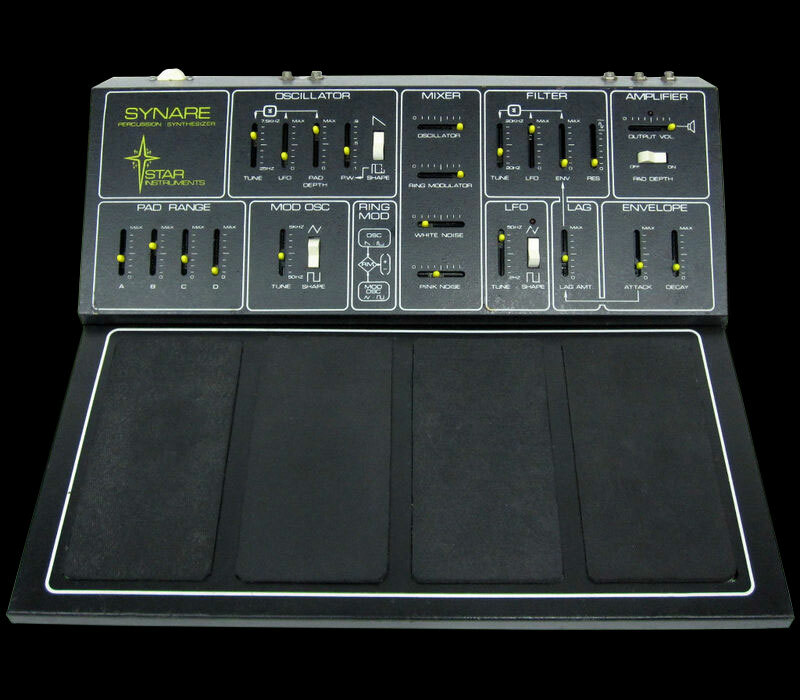 The Synare is a drum synthesizer, meaning that it was indeed a synthesizer, but it was not controlled via a key bed, rather it was triggered by hitting a drum stick on the rubber pads that are pressure-sensitive. The Synare had four rectangular rubber pads that were interfaced to a main control module that was equipped with a single oscillator producing pulse and sawtooth waveforms. It also had a white noise generator, Low Frequency Oscillator (LFO) with triangle and pulse waveforms, a mixer and a low-pass filter with both Resonance and Cutoff. It also featured an envelope generator with ADSR. Star Instruments built the series of Synare drums from 1975 to 1981. Perhaps most famously, the Synare was reportedly used by Anita Ward on her hit disco single, Ring My Bell. It was also used by, Alan Myers of Devo, David Robinson of The Cars, Gary Numan, Warren Cann of Ultravox, Stephen Morris of Joy Division and New Order, Lol Tolhurst of The Cure and Depeche Mode to name a few.